Our largest convening space, the first floor Goldman Theater is ideal for film screenings, lectures, author appearances, forums, and awards ceremonies. It is ADA accessible. Featuring environmental art exhibitions with works by local and national artists, our first floor Hazel Wolf Gallery and Atrium Lobby is the perfect space for your next reception. The first floor Kinzie Room is best suited for intimate classes, meetings, or breakout sessions. 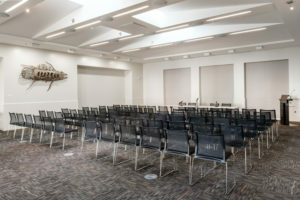 Easily the Brower Center’s most versatile space, the second floor Tamalpais Room is ideal for a variety of special events, meetings, seminars or presentations. With views of the Berkeley hills and stunning landscape design, the second floor outdoor Terrace is a great space for a cocktail mixer, meal seating, or informal gathering.